We survived the move! One week in our new house, and we’re still bleary-eyed, bruised up and generally exhausted but feeling a little closer to settled each day. It was an epic day, that Moving Day. We hired professional movers, who did a wonderful job handling our stuff but underestimated the job by about six hours and half a truckload. It made for a very long day for all of us. Jon pitched in to help unload the truck here at the new house on the first run while I tried to clean around the stuff still left at the old one. The movers arrived for round two at about 8:30 p.m. At 10 p.m., I said my final good-byes to our little house on Holloway Court, mopped myself out the front door and made the trek south to the piles of boxes waiting at the new house. Jon had done a remarkable job getting the kids to bed and the bedroom to as cozy a state as possible. (Of course, there was also the incident where he locked us out of the house before I’d stepped foot inside and had to kick open the back door to get us back in…) We finally fell into bed exhausted at midnight, a pattern that has continued for the past week. I am certain we would not have survived without the generous help of so many family and friends. I haven’t had a lot of time to reflect, but there’s nothing like the labor of cleaning and arranging a home to foster the necessary bonding. I’ve had bouts of homesickness for the familiarity of the old house, and depression creeps in when I look at how much work still lies ahead. The cure, I’ve discovered, is simply stepping into the back yard for a few moments. Lying in the hammock, staring up at the leaves above me, watching the dozens of fireflies that magically appear at dusk, glancing over at the deer wandering through the woods just up the hill… It’s impossible not to fall in love all over again. There has been a steady procession of wildlife through our yard since we moved in. 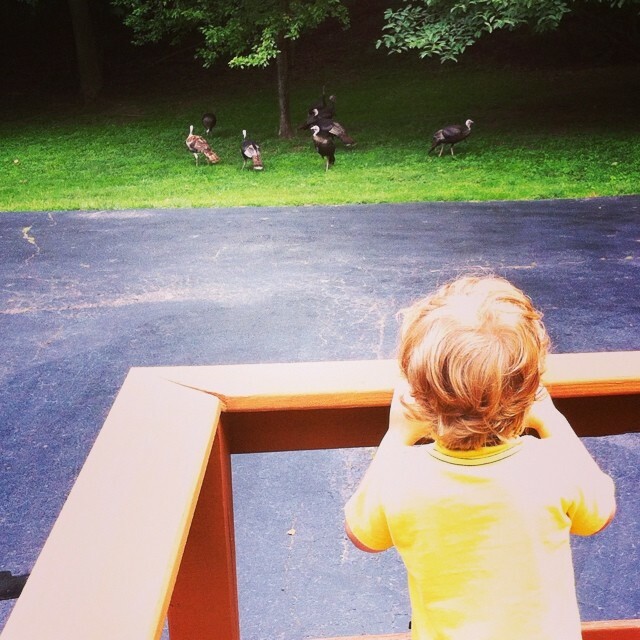 A doe and two fawns make frequent visits, and flocks of 20-plus turkey have paraded right by our deck and windows. Five horned buck hung out on the lawn for a while a few days ago. It is beyond our wildest hopes, and those joys have made the transition easier for us all. The truth is this house feels remarkably comfortable and has since we first saw it. It’s not especially fancy – at least not by Brentwood standards – but it feels like us. I look out the window from our bedroom as I type, down the quiet cul de sac across to the wooded hills surrounding us, and I know: I am home. This entry was posted in Uncategorized and tagged brentwood, home, move, new house.